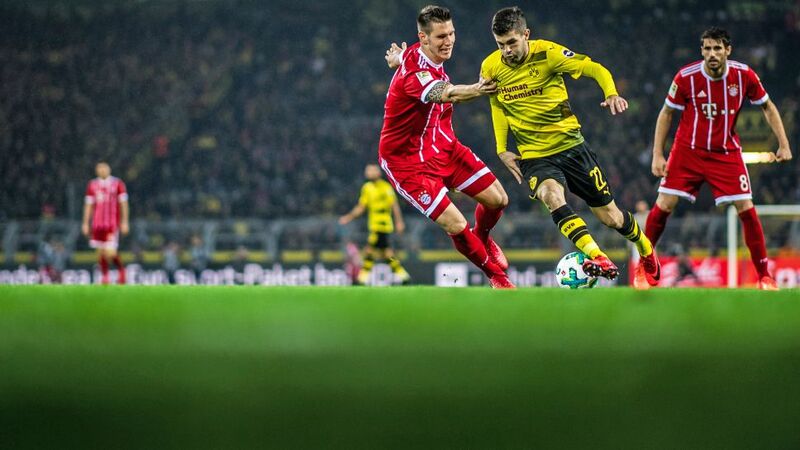 Bundesliga | Borussia Dortmund and USA attacker Christian Pulisic: A twist on Thomas Müller's Raumdeuter role? Borussia Dortmund and USA attacker Christian Pulisic: A twist on Thomas Müller's Raumdeuter role? It's no secret that Borussia Dortmund's Christian Pulisic is the most gifted soccer player the USA has ever produced. The 19-year-old has all the attributes needed to scale world football's summit, including the ability to play on both wings and as a No.10. There's probably even a false 9 in there somewhere, too. But what is Pulisic really? Could we be witnessing the birth of another Raumdeuter ('space interpreter'), Thomas Müller's self-appointed role for Bayern Munich and Germany? Or is he carving out his own inimitable path to the top? Defensively, Pulisic's work rate is more in line with a full-back or conventional wide midfielder. Statistics show he spends more than half his time on the pitch running without the ball, whilst covering, on average, 6.3 miles per game. That's not to say he's about to usurp Lukas Piszczek as Dortmund's first-choice right-back, but it does highlight a willingness and industry not completely within the remit of a pure-bred winger. How often do you see Arjen Robben busting a gut to get back and help out Joshua Kimmich at Bayern? Nevertheless, Pulisic is - like Robben - an attacking player by definition. He has the gumption to run with the ball at opposition players, create and take chances. At one point during 2017/18, he had even attempted more dribbles - granted with less success - than Lionel Messi and Neymar. In terms of end product, the Hershey native's nine goals and 14 assists in 70 Bundesliga appearances in his two-and-a-half seasons as part of a wildly inconsistent Dortmund side point to a player still searching for his niche. Not that anyone should be pigeonholed. So if Müller is the 'space interpreter', what does that make Pulisic? Age and experience aside, Müller's superior output – 25 goals and 24 assists in his first 70 Bundesliga games, 104/112 overall - boils down to playing regularly in a fully firing system, tailor-made for his skill set. Pulisic hasn't always had that luxury. Under ex-Dortmund coaches Thomas Tuchel and Peter Bosz, the American prospered in overtly attack-minded teams, where he had license to manipulate pockets of space and affect the game as he so freely does for the USMNT (he is currently averaging a goal or assist every 1.3 matches at international level). The conservative approach of Peter Stöger during the second half of 2017/18, on the other hand, narrowed his impact in the final third. Happily, Lucien Favre - BVB's new man at the helm – has a habit of striking the right balance between defensive discipline and free-flowing forward play. Individuals with all-round diligence, flawless technique and a touch of panache are essential. Potential to improve is desirable. Pulisic, apply here. Pulisic might not be the next Müller per se, but he could be the next Raumdeuter – or rather a unique rendition of a seemingly indefinable role. Space interpreter, space invader or even space hopper: the next stage of his evolution will be fascinating.